Hour 1: The Flies Walked into the Web . . . – All of My Issues! Hour 1: The Flies Walked into the Web . . .
“Hour 1: The Flies Walked into the Web . . .” is how one of the most terrifying comic books ever written begins. 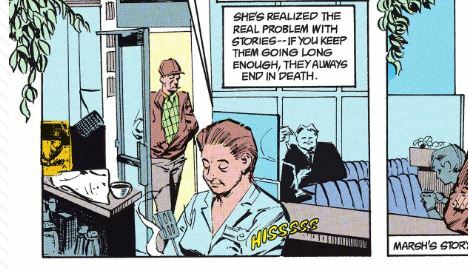 The comic is Neil Gaiman’s Sandman, and the issue we are referring to is number 6. The title of the story is simply “24 Hours”. The premise of the story is one where we find the titular character reclaiming one of his stolen artifacts, a ruby. The story isn’t really about him though. It is about the people affected by the item being with someone besides its rightful owner. In the story, the ruby ended up in the hands of Doctor Destiny. If you’ve never read the story before, do yourself a favor and check it out. Entertainment Weekly has the first few pages of the issue posted on their site, and you can find it at the following link . . .